It is the end of the world...or very close to it anyhow. We are introduced to ashen ruins of what once was Northern America, now transformed into a slob of lawless grey hell on Earth, devastated by nuclear war. Here and now, scant survivors who haven't abandoned the mores and constraints of old civilized Earth are preyed upon by the ruthless gangs which forsook even the greatest taboo of all – feasting upon the flesh of fellow men and women. In such a godforsaken place we partake the journey of one man and his son on “the road” predestined from the beginning to end with a disaster. The above passage chimes eerily prophetic. The tone of the book does not change often, and even then it might be for the worse and not for the better. I should confide to you right away, that this book mesmerized me. I cannot remember the last time a work of fiction awed me so. “The Road” is a heavy-hitter, a true emotional sledgehammer. You ought to be inhuman not to sympathize with one forlorn man and his offspring on their sordid journey, fighting a hapless struggle against the dying earth and the scum that pollutes it. McCarthy employs a very detached and unembellishing prose; he strums the exactly right emotional cords, and doing it in such a virtuoso sequence so that the story does not turn out overbearingly dramatic or even cheesy. The story is compelling enough to keep you turning the pages, but at the same time you are really afraid to go on, because you don’t want anything bad to happen to the main protagonists. This (1)inherent tension as well as (2)the masterfully built suspense (=)point at a perfect example of literary master work, in my opinion at least. Our main protagonists, actually the only people really worth mentioning, remain elegantly unnamed, and known to the reader only as “the man” or “papa” and “the child”. McCarthy’s dogged and unblemished descriptions of banal menial chores that only result in small triumphs, which would seem inconsistential in “normal” circumstances, but in the world they are living in decide the difference between life and death. All the above mentioned strategies that the author uses might seem as simple writing tools, but wielded by the hands of such a gifted writer as is McCarthy, they become very powerful – powerful enough to win him the Pulitzer award. 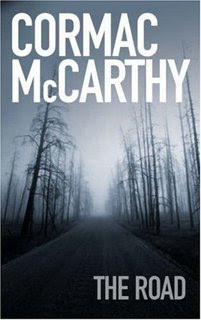 The Atmosphere McCarthy creates is at once simple, extra-sensual, desolate as well as terrifying. “The Road” therefore functions not only as a post-apocalyptic science fiction novel but also as an imaginative horror story. The biggest off put I can come up with is the ever-present, soul crushing sense of doom. You really have to be in the mood for such an emotionally laden and disturbing tale. But after you turn the last page, you really feel a sense of accomplishment and all the effort pays off. I must admit that I haven’t read any other works by Cormac McCarthy, but if his other writings are nearly as good as this one, I really should. A bit of trivia – his novel “No Country for Old Men” was adopted to film last year and won 4 Oscars. Congratulations! But this fact doesn’t really surprise me. A brilliant novel. Read it. I agree, it's an amazing book, and yes, soul-crushing at the same time. Why only a score of 4.5 though? I don't think books get any better than this... Did you find some flaws other than the depressing nature of it? Thank you for dropping by Peadar. It's nearly a perfect book,yes - but my philosophy goes that brilliance is only a teoretical ideal, unachievable in real life; the same goes for 0/5 points. There is nothing that is flawless or couldn't be improved further, as well as there is nothing that I feel fit to judge completely worthless. :-) Fair enough then. I just used to have a chemistry teacher at school who made us mark our fellow students on their work. If we gave "9 out of 10", his question was always: "Why did you take one away?" Anyway, I enjoyed the review. i've read this book and i'm utterly blown away.. one of the best books i've read in the last five years.. I'm glad you enjoyed the book monster. The Road could perhaps be my favorite Cormac McCarthy novel, which is a tough choice given how good his other novels are. It is powerful, haunting, and mesmerizing. I've never felt so emotionally drained by a novel in my entire life. I finished the novel many months ago, but it has still stayed with me. I'm not sure if I can put it out of my mind, as it was such an oxymoron of an experience. Reading it was like a punch in the gut. At first, terribly painful and intimidating. Finally the adrenaline hits your brain and you feel euphoric. You feel a rush of emotions, and become lost in a flood of passion. Chapter by chapter, I felt this terrible pain. I cried. I was depressed. There was no hope. Your emotions are on edge because you want the man and his child to live. You want them to be happy and safe. But you know that it is never going to happen. So you get angry, horrified, sad, happy, hopeful and you feel a million other things. Only its all amplified. The slightest sentence can crush your soul with depression, or make you feel joyous with hope. It was a really strange experience for me. Cormac somehow managed to lay out his story in a such a way that it stripped down my defenses, and laid bare all my emotions.